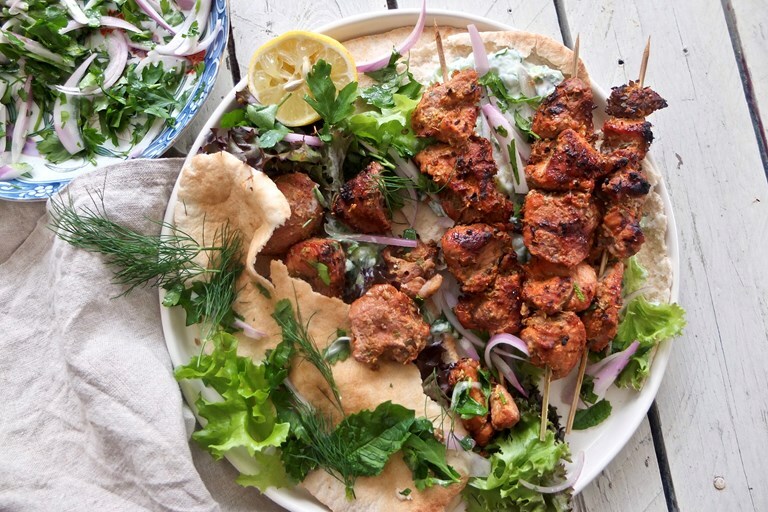 This pork souvlaki recipe comes straight from the balmy climes of Greece, where people have eaten barbecued pork alongside fried potatoes, tzatziki and flatbreads for centuries. Don't skimp on the lemon, oregano and garlic – they provide an important punch that really brings this dish to life. I once spent a wonderful day in Athens grazing on souvlaki, and learning that people have strong opinions on this traditional form of Greek barbecue regarding the correct accompaniments and style of serving. The most common meat to use is pork although lamb, chicken or beef are also used. It’s important to get the flavours right too, with lots of fresh lemon and oregano; the end result should be bright, fresh and filling. Traditional souvlaki in Greece tend to be served with the meat alongside the accompaniments including fried potatoes and tzatziki, although modern vendors will serve everything in one compact wrap. My Greek friend was somewhat conflicted about the modern trend for adding chips but I say, why not?